Aim: To evaluate the effectiveness of various internal fixation hardware used for treatment of symphyseal and parasymphyseal mandibular fractures based on a single institution`s experience. 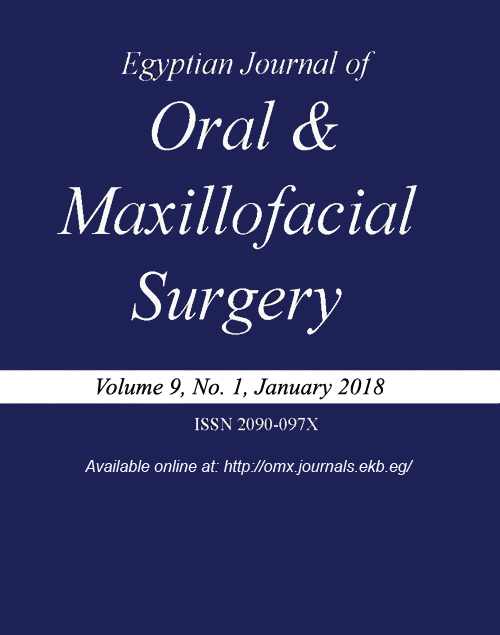 Materials and Methods: In this retrospective clinical study, one hundred patients with fractures of the anterior region of the mandible involving both the symphysis and parasymphysis areas were included. All cases were selected from the patients` records who were treated in the oral and maxillofacial surgery department in a 4 years period extended from May 2013 to May 2017. Surgical admission notes, x-ray reports, operation records, outpatient notes, and complications were recorded. The patients were followed up periodically until a minimum of 6 weeks. Results: The distribution of fracture pattern was as follows; 53 patients with anterior mandible associated with subcondylar/condylar fractures, 31 with anterior mandible in association with mandibular angle fractures, and only 16 patients with isolated anterior mandible fracture. The majority of the fractures (40%) were treated by 2 miniplates, followed by the 3-D miniplates (17%), equal use (12% each) of (2 lag screws, 1 lag plus 1 miniplate and 1 reconstruction plate), then 1 lag screw (4%), and the least was the use of only 1 miniplate (3%). Conclusion: Proper selection of the fixation method for anterior mandibular fractures is essential to guarantee a successful treament and early restoration of function. Each method has its own advantages and disadvantages, and each case should be treated individually based on proper diagnosis and planning.